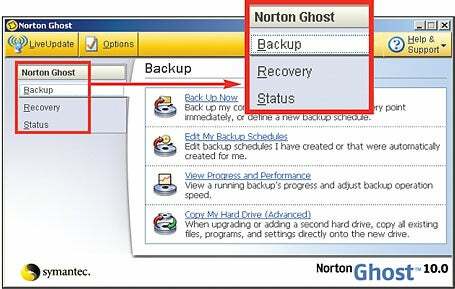 Symantec's Norton Ghost 10 has a basic, easy-to-use interface. Disk-imaging software lets you create sector-by-sector copies of hard-drive partitions, including boot information--so when disaster strikes, system recovery is a snap. Symantec and Acronis take different approaches to this crucial task in the latest updates of their disk-imaging applications. While Symantec's $70 Norton Ghost 10 focuses on improved usability, Acronis's $50 True Image 9 contains several new, must-have features. Both programs perform the same basic functions of creating and restoring full and incremental images to hard drives, CDs, or DVDs. And the two apps simplify automating and scheduling those processes. But the shipping version of True Image 9 that I tested permits differential images, which Norton Ghost 10 does not. Whereas incremental backups include only the data that has changed since your last backup, differentials allow you to create a single file containing all of the changes that have occurred since your initial full backup. That way, you never have to restore a large number of small incremental images. 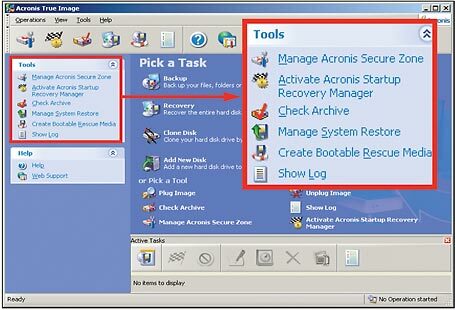 True Image 9 from Acronis offers users more features up front. Equally useful is the new option to back up selected files and folders, which eliminates the need for a separate file-level backup program. Acronis has also added a Snap Restore function so you can work in Windows before you finish restoring an image--great if you're on deadline. The biggest change in Norton Ghost 10 is the program's new interface, which does a nice job of guiding beginners through tasks while keeping various advanced options out of sight--but not out of reach. However, Ghost 10 cannot create an image while operating from its extremely slow-booting installation/recovery CD. So if your system goes down, the utility can't create an image to help you recover any un-backed-up data stored on a crashed partition. Symantec does bundle the older Norton Ghost 2003 (included mainly for Windows 98 users), which can create an image while running from its CD. But True Image 9's recovery CD handles everything that its Windows application can, and that's a far better approach. When it comes to features and price, you can't beat True Image 9. But I give credit to Ghost 10 for making an esoteric task easier for new users. A simple and effective way for less-tech-savvy users to back up all the data on their PCs. The most powerful imaging suite available--and it's reasonably easy on the wallet, too.